Melvin J. Rudd Jr., son, Dennis J. Rudd, 7 brothers and 3 sisters, grandson, Craig and great-grandson Hunter. She is survived by sons Corey L. (Shelly), Gevan C. (Joyce), Tobin G. (Irene), C. Kirk (Sharon), daughter, Shauna A. Lambert (David), daughter-in-law Brenda; sister Betty Williams (Lewis), 32 grandchildren, and 69 great-grandchildren. 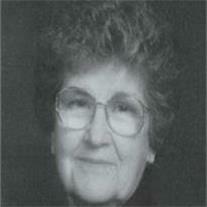 Visitation will be Friday, December 2, 2011 from 6 – 8 pm at Bunker’s Garden Chapel, 33 N. Centennial Way, Mesa, AZ. Funeral Services will be held at 10 am on Saturday, December 3, 2011, The Church of Jesus Christ of Latter-day Saints, Lazona Ward, 1345 E. University Dr., Mesa, AZ with visitation held one hour prior.